When looking for a topic for this week’s blog post I decided to highlight our VAX high pressure coaxial style valve and how Bio-Response Solutions successfully uses it in their alkaline hydrolysis systems for human and pet disposition. Yes, our VAX is used to help dispose of bodies. Whenever I bring this application up for discussion, I receive appalled looks from fellow employees so I figured Halloween would be one of the few times that they would find the topic of human remains disposal, acceptable. In reality, this method of disposition is a greener alternative to traditional burial and cremation. Families can make a lasting contribution to the environment on behalf of their loved one by making a decision that saves energy and reduces pollution. The Alkaline hydrolysis process has been used worldwide in laboratory and research applications. In the early 1990’s commercially viable alkaline hydrolysis systems for major veterinary schools and disease diagnostic institutions were available throughout the U.S. and in the United Kingdom this process was used to destroy the carcasses of cattle with mad cow disease. The development of human disposition by alkaline hydrolysis began in 1995 with the installation of the first commercially sold system for multiple cadaver dispositions for the State of Florida. 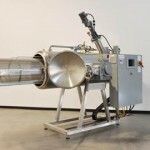 High Temperature Alkaline hydrolysis is a fully automated process of pressure, high temperature, and alkalinity to accelerate the natural process of tissue hydrolysis decomposition by using a strong alkali (pH 14) to solubilize and hydrolyze tissue, expedited by heat at 150°C in a pressurized vessel. 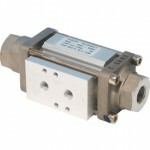 The integral load cells weigh the body and the appropriate amount of water and alkali are added automatically to the vessel. 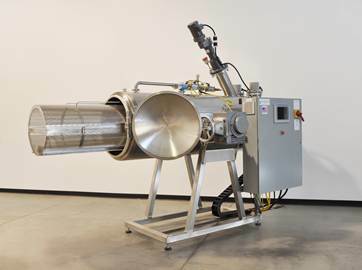 The vessel is quickly heated via steam to around 150°C (~300°F) and the body is resolved to its component elements. The entire process is complete in a few hours. This process generates a solution of amino acids, peptides, sugars, and soap (salts of fatty acids) that is suitable and safe for release into the environment. The process is environmentally friendly because it does not generate air pollution and the embalming fluid is neutralized into a harmless chemical compound that can be recycled back to nature as fertilizer or simply flushed into the sewer system. It incurs 20 times less CO2 emissions vs. average cremation. It is energy efficient, using 1/10th the energy per body versus cremation. Similar to cremation, the only solid remains are the mineral ash of the bones, which are returned to the family in an urn. For the budget conscious, it is 3-5 times less expensive than cremation. It is projected that within 5 years hundreds of systems will be in use in California, Oregon, and Washington. 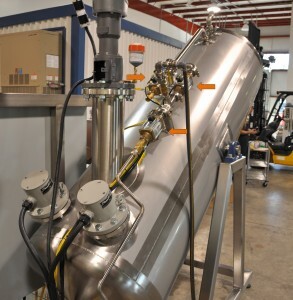 Bio-Response Solutions, Pittsboro, IN, uses three VAX compact automated valves on their low temperature alkaline hydrolysis model. Two VAX’s are used to run cold water into the unit and one runs hot water into an internal spray bar. For over 17 years, Bio-Response Solutions has specialized in alkaline hydrolysis systems and effluent decontamination systems. They offer both High and Low Temperature Acid Hydrolysis systems for human and pet remains. They state that individuals who were the first to select this form of disposition for their loved ones, chose the option for environmental reasons and because to them it seemed more gentle and dignified than the traditional cremation process. This entry was posted in Alkaline Hydrolysis Systems, Latest News and tagged Alkaline Hydrolysis Systems, Compact Automated Valves, VAX Series. Bookmark the permalink.